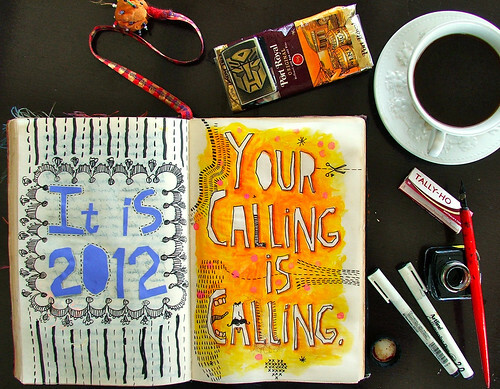 I went browsing through my old journal entries today, looking to catch the flavour of the year just-past in its pages. It’s become a tradition of mine to look back upon a year, and then give that year a name. Usually, the name is taken directly from the one situation, event, experience, or period that stands out—not only because it was meaningful or intense, but because it is not likely to be repeated in quite the same way again. I’ve been doing this since 1994, and I keep the slowly-growing list right up front, on the first or second page of each of my journals. When a journal is full, I copy the list into the next journal I’ll be using. It’s fun, yes, but reading through old journals can also bring on an intense longing. Time, after all—your bright days and brilliant moments, your triumphs and treasures and epic loves and personal, magical encounters—has been reduced to less than two thousand yellowing pages covered in a small, italic handwriting. Is this it, then, my Life? A shortlist of named years—The Year of the Island, The Year of The Seagull & The Star, The Year of The Health Care Plan, and so on—and half a dozen thick, heavy, dog-eared books filled with words, words, words, some clippings, some photos, some drawings and painted pages? asks Doris Lessing, in her Introduction to The Golden Notebook—that massive novel about a fragmented woman who obsessive-compulsively records her life in four separate journals at a time. Experiences of great intensity—an especial dream, a period of concentrated work, a sudden absorption, maybe a love-affair—have in common that they are unusually real while they last. Yet it is precisely this quality which so easily vanishes. Afterwards, how unreal it all suddenly seems! We lost ourselves in that dazzling fugue whose importance to us we do not doubt and yet which now is so imaginary. Time which seemed not measurable, so endless, suddenly lapses back into the diurnal and leaves behind it disquiet and longing for a lost intensity. We observe that there is no rapture which will not later seem chimerical, no vision or intellectual fervour which will not come to feel more vaporous than that waking sleep, the dull discourse of ordinary days. It becomes a toss-up as to which is the more delusional: the higher reality or the lower. For everything shares a common insignificance in this vain pursuit, this hapless devoir of taking an accurate stock of how things are before they cease to be. Yet there does remain a knowledge, like the pleasurable stiffness in muscles after a previous day’s unaccustomed exercise, to prove that something occurred. Something did after all take place to tax the muscles of the mind. 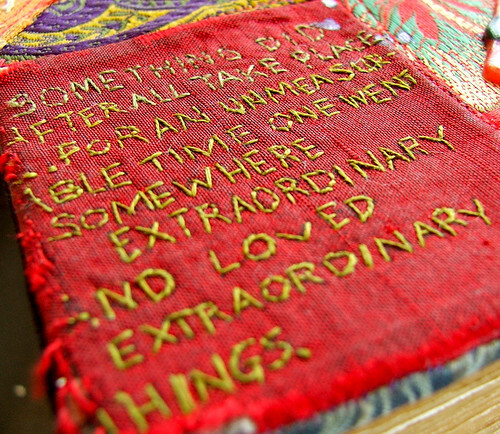 For an unmeasurable time one went somewhere extraordinary and loved extraordinary things. One has been a traveler; and it is not a traveler’s feet which ache. 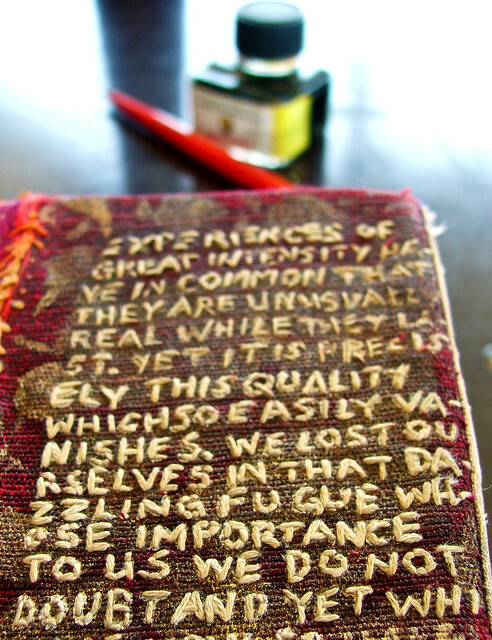 What a wonderful entry to start the new year, Nat, and what an extraordinary new journal. 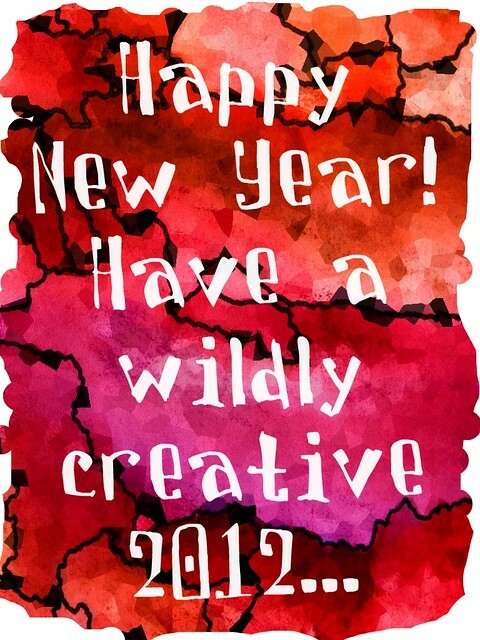 🙂 Here’s to a wildly creative, chock full of love, life and laughter 2012 for all of us. I miss you! Great post! Have an Extraordinary 2012! Thanks, Dave! To you and your family, too, an awesome 2012. What a wonderful post! Thanks so much. I am so glad you enjoyed it, Wazeau. Thanks, and Happy New Year!